Over 300 million liters of oily water bumped out of the underground containers. 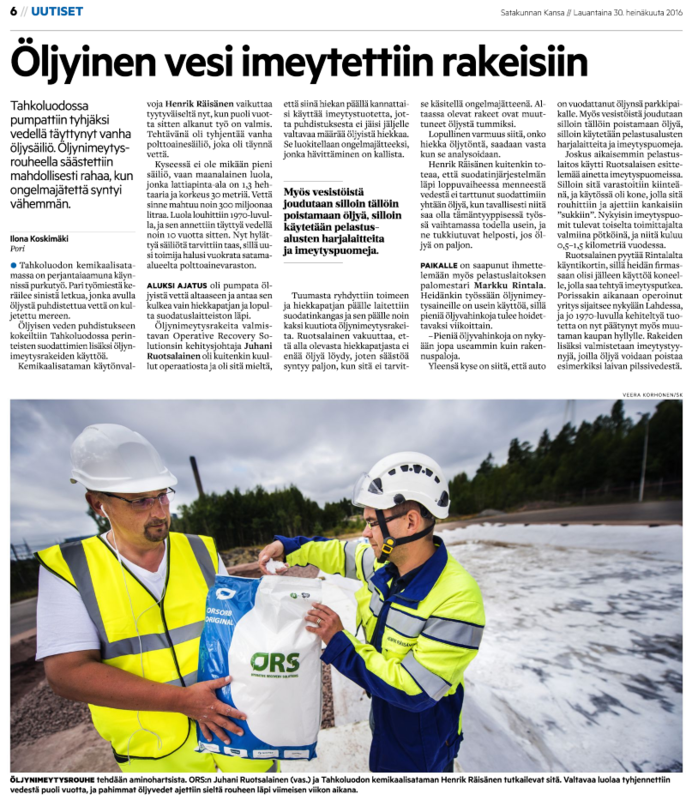 Waste oil is separeted from the water using ORS-Sorb® Original on a sand matress. 1 liter of ORS-Sorb® absorbs 0,9 liter oils/liquids. Easy to collect from the water, for instance with different skimmers. 99% of the absorbed liquid/oil can be pressed out for reuse. Non-flammable, Flaming point 2000 degrees of celsius. Det Norske Veritas (DNV), NCP, Sintef etc. 1 liter of ORS-Sorb® absorbs 0,9 liter of liquids. Non-flammable. Flaming point 2000 degrees of celsius. ORS-Sorb® Pillow is available in three different sizes. Can be used a continuous period of 3 months or until full capacity is absorbed. Drytoilet can be used in festivals, camps, cottages, in boating and in the events where placement of latrine is difficult. ECOt! Drytoilet can prevent the spread of faecal bacteria , when users are limited and usage time is short. ECOt!® Drytoilet can be used for months or until the drytoilet is full and absorbent material does not absorb anymore. Products lifecycle is approximately 15-20 times of usage. and functionality in sea and lake waters. using of three different types of oils. ORS-Sorb® absorbent material can be easily burned. Burning process doesn’t create much ash and is environmentally safe way to dispose the waste. Once the absorbent material is clean the waste can be used as a fertilizer (contains 26% of nitrogen). Absorbent waste is biodegradable and doesn’t contain any toxics. Non-toxicity test report is available. The original material was invented and original production equipment developed by a Finnish researcher already at the 90’s. Since then continuous product development has been made. Based on gained experiences and test results during substantial accidents in the field, like Exxon Valzed, new features has been developed. Today we are able to offer excellent product quality with outstanding performance. Company Oy Operative Recovery Solutions JMR Ltd was founded 2011 in Finland. Product development is now made in cooperation with Finnish and international professionals. The first mobile production unit was built at the end of 2012. During 2012-2014 several tests, research and product development was done. New investors was also found in 2014 which enabled strengthening of company resources in product development and internationalization. Today Oy Operative Recovery Solutions JMR Ltd (ORS) is known as a forerunner in developing innovative and state-of-the-art recovery solutions and products for recovering oil from the water surface. Our core business is to provide solutions for cleaning and recovery of oil spills based on ORS-Sorb technology. Products are suitable for all liquids. ORS-Sorb® is a registered trade mark. We are offering solutions and services for various industry branches and agriculture in the international markets.